These inviting homes give the term "getting back to nature" a whole new meaning. From floor-to-ceiling windows to a house built around a tree, scope out the homes that made our editor's top picks of the week. Featured homes were submitted by members of the Realhitz community through our Add a Home feature. Add your home to Realhitz.com/homes today. 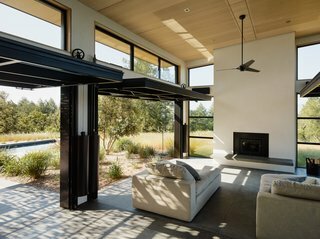 From the architect: "Four oversized glass panels open dramatically on each side, transforming the space into an outdoor pavilion whose flush concrete floors extend into a poolside patio to the north and into a terrace featuring a fire pit to the south to offer comfortable outdoor areas for both hot and cool weather. With these doors drawn up, the site offers one sweeping, continuous view from the pool, through the great room, and down into the distant village below." From the architect: "The tented roofs and walls allow a connection with the natural setting—its sounds and changing seasons—while large clear and mirrored-bronze glass windows frame views of the landscape and neighboring 'rooms.' 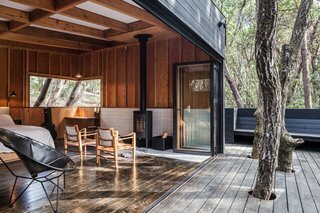 Wood-framed walls and floors lend warmth and support the comforts of modern living, deep within the forest.Here, the forest and house are one with indoor and outdoor rooms suspended between the treetops and canopy floor." From the architect: "Located in a place of extraordinary history—a neighborhood rescued from flooding, ancient wooden villas, farmsteads and brick cellars with granaries—that dates back from the second half of the 19th and early 20th century. With breathtaking views of the lake and castles in Czorsztyn and Niedzica, both the shape of the building and interiors are a unique interpretation of the traditional architecture of this Polish region." 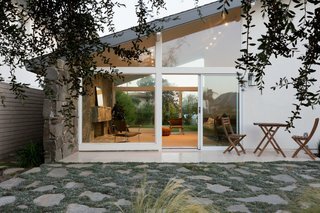 From the interior designer: "Being in such a beautiful and temperate part of California, the home was just begging for some open air spaces. What better way to get the harbor view in than opening up the kitchen completely with bi-folding doors?" From the architect: "The new project is built around the original patio. Now, all the rooms—either adapted or constructed—are linked to the patio, giving vitality to what is now a new house. During the construction, a second floor was added for the bedrooms and an area was adapted for parking. 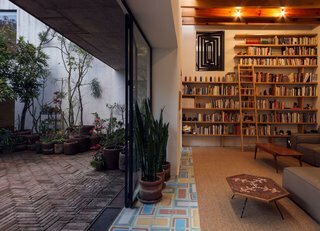 The string of rooms was converted into one large space connected to the patio, to create the central focal point of the house." Want a chance to be featured? Add your home! Let us know.